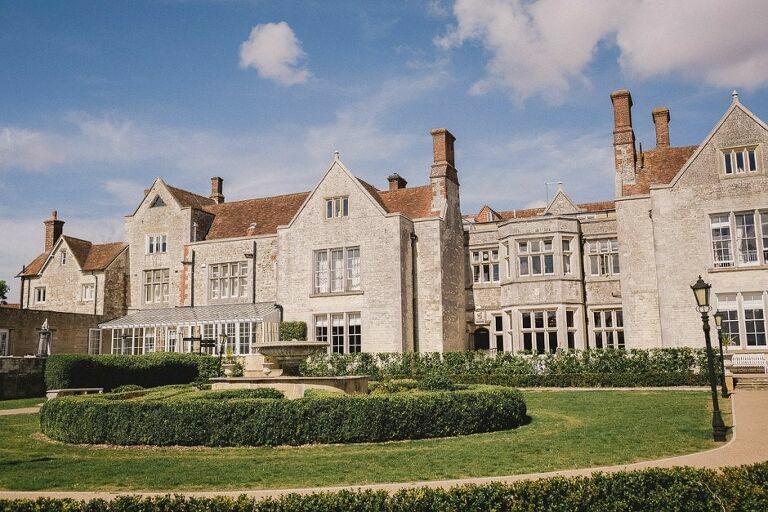 Located in the picturesque village of Upper Froyle in Hampshire, just off the A31, midway between Farnham and Alton, and an hour or so from London, you’ll find Froyle Park Manor – a wonderful wedding venue to celebrate your special day with friends and family. Surrounded by 80 acres of glorious rolling countryside and steeped in history, the grand Manor House dates back to 1086 when it was a royal manor, and sits proudly overlooking the spectacular views. The current manor house boasts elegant Jacobean features, and was built in 1620 on the site of a former monastery. As you drive through the gates and up the stately tree-lined path, past the fountain, you can’t fail to be impressed by the splendor of the setting. Froyle Park is indeed a truly romantic location offering many stunning backdrops for your memorable wedding photographs – including the large, ornate fireplace and the grand staircase. Froyle Park provides many options for you and your partner to exchange your wedding vows. Each room has its own unique charm and all offer the perfect space to welcome your quests. Within the elegant Jacobean Manor there is a choice of several rooms to hold your reception drinks, before and after your wedding. From the luxurious oak-panelled Great Hall, the spectacular Grand Ballroom, to the smaller, more intimate Drawing Room, the Jephson Bar, and the Morning Room with a piano. Your guests can relax and enjoy the music whilst admiring the far-reaching views over the estate and the surrounding countryside. And outside, don’t forget the striking dome, complete with a beautiful decked seating area and delightfully manicured gardens. A charming place to hold your ceremony. Froyle Park is also popular as a venue for Asian weddings. For the more traditional, couples may be able to exchange vows at the altar in the beautiful St Mary’s village church, just a short stroll from the manor house. Available for exclusive use and offering complete privacy for up to 300 guests, the Froyle Park country manor house and its extensive grounds offer one of the south of England’s most photographic-friendly settings. Everywhere you look, there’s no shortage of varied backgrounds for your stunning wedding pictures. You’ll certainly be spoilt for choice, and you and your guests will come away with many happy memories of the day. Not found your perfect venue yet? Why not take a look at some of the other venues in Hampshire that I’ve photographed. If you’d like to enquire about my availability for Froyle Park please get in touch here.